Vikram Chauhan, who led a mob of lawyers to attack JNUSU president Kanhaiya Kumar at the Patiala House Court on 17 February, was felicitated by his colleagues today at the Karkardooma Courts. 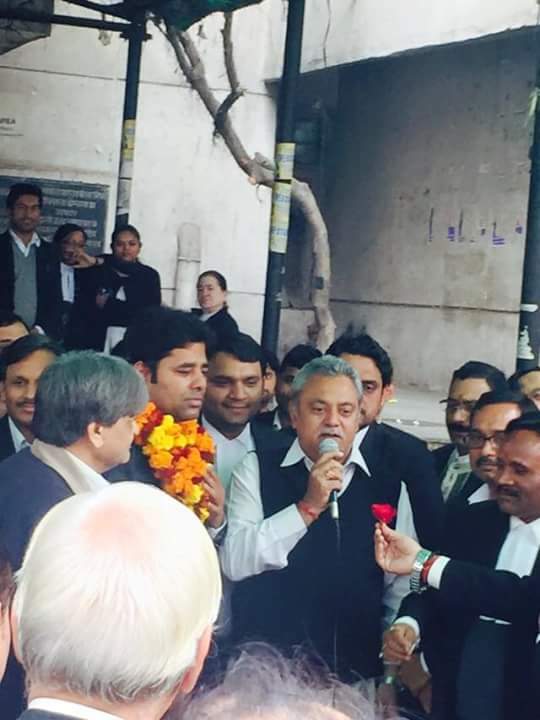 Chauhan was congratulated and garlanded by other lawyers. They also clicked photographs and posted them on Facebook. On Wednesday, a group of persons dressed as lawyers, led by Vikram Singh Chauhan, unleashed a brazen attack on journalists and JNUSU president Kanhaiya Kumar at the Patiala House Court complex, two days after they were caught on camera thrashing scribes and JNU students and teachers branding them as "anti-nationals". 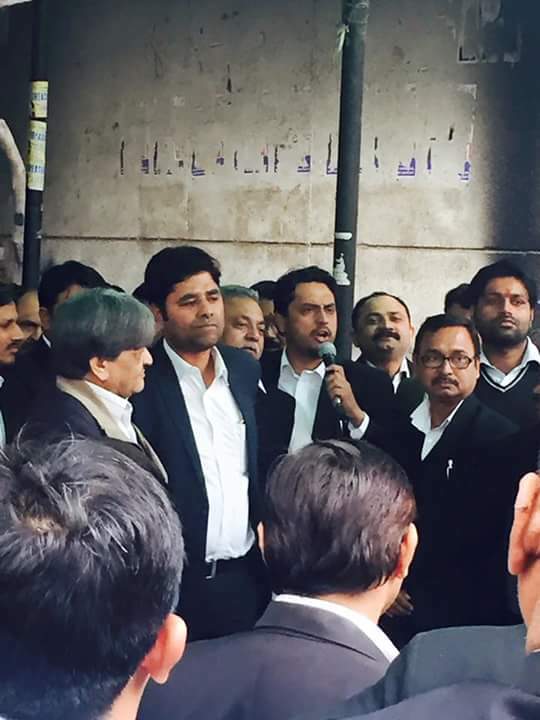 But Chauhan was lauded by his fellow lawyers. Here are some of the photographs the group posted. 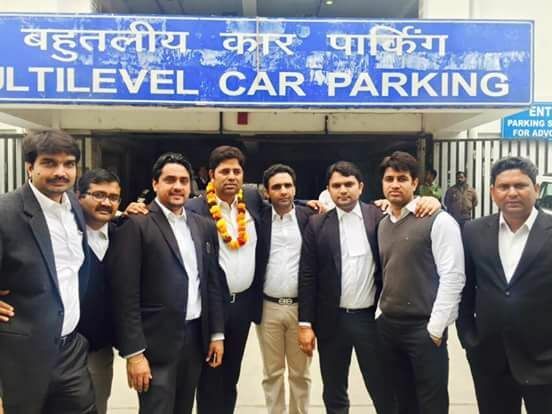 The celebratory photographs come despite the threat of losing their licence and a summon from the Delhi Police Police looming large over the group of lawyers. The Bar Council of India has decided to crack the whip on the group of unruly lawyers who engaged in violence at the Patiala House Court complex on Wednesday. Apologising for the violence - the second such incident at the court premises - ahead of the hearing of JNUSU President Kanhaiya Kumar's sedition case, BCI Chairman Manan Kumar Mishra said that if found guilty, the licenses of the errant bar members would be permanently revoked. Delhi Police Commissioner BS Bassi, who has come under attack for not controlling the rogue lawyers, defended his the decision to not crack down on them. He told CNN IBN: "As an ordinary citizen you think he committed an offence, but we have to view it through the eyes of law." He said that Chauhan had been issued summons. "If Vikram Chauhan does not appear on 18 February, I will have to approach the court," he added. While Chauhan has denied association with any political parties in his media interviews, his Facebook timeline has a number of photographs where he can be seen posing with several BJP leaders, inclduding Home Minister Rajnath Singh, MoS for the Ministry of Commerce & Industry, Nirmala Sitharaman and senior leader LK Advani. On being asked why he felicitated the organiser of violence in Patiala House Court, the president of bar association of Karkardooma court said that the honour was for speaking out against anti-nationals. "What Vikram Chauhan did was upholding his nationalism, what's wrong in that? That's what should be done to those who raise slogans against the country," Mahesh Sharma, the bar council president of Karkardooma court said. When Sharma was asked whether felicitating Chauhan meant supporting the violence he and his accomplices wrecked upon journalists, he said, "media people are our family. Small incidents happen within the family, it's not a big deal. We'll sort it among ourselves," said Sharma. As a counter-question Sharma asked, "what would you do if you are a Hindu," at which point he corrected himself, "I mean an Indian and someone raises Pakistan slogans?"